Experiencing a sunrise from up high in a hot air balloon is magical, breathtaking and awe-inspiring. The striking colours, the early morning light and the thrill of watching the city and nature around you awaken and start a new day is simply spectacular. Your sunrise hot air balloon flight over Melbourne will see you drift over an array of stunning parks and gardens and some of the city’s most iconic sporting venues such as the MCG, Melbourne Park and the Albert Park Grand Prix racetrack. 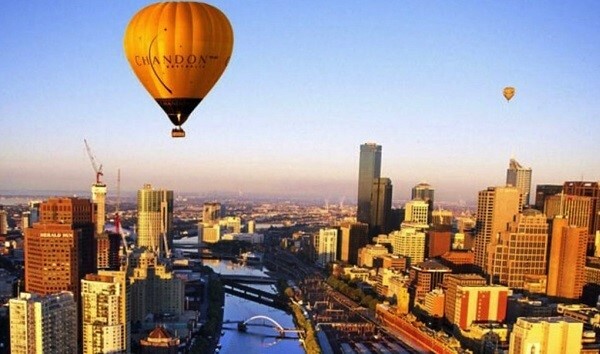 If you are looking for a romantic experience to share with your special someone, you simply can’t go past a Melbourne hot air balloon flight. Hold each other tight as you watch the world pass by below and the sun come up. Feel the wind on your face and those first few rays of sun on your back as you enjoy magnificent views with your loved one. Hot air ballooning impacts your well-being in a number of positive ways. The flight is a relaxing and uplifting experience which can result in a release of endorphins, increased heart rate and improved oxygenation of the blood. You not only feel happier and euphoric during the flight, a lot of people feel on top of the world long after the flight has ended. Reaching up to 5,000 feet above the ground, hot air balloons provide an unrivalled vantage point to appreciate just how beautiful the city is. Unlike an aeroplane or helicopter, a hot air balloon promises 360 degree views of your surroundings. Even if you have lived in Melbourne for years, you will discover a side to the city you never knew existed. Join Melbourne on the Move for a Melbourne balloon flight followed by a Peninsula Hot Springs Tour. Your memorable day includes the flight, a 5-star full buffet champagne breakfast at Pullman on the Park, transport and entry to a Peninsula Hot Springs Bath House.